The van was ordered without the off-road bumpers that Sportsmobile resells (Manufactured by Aluminess). We were very wary of the utility provided by these very expensive bumpers, and figured we could wait and install them later if desired. 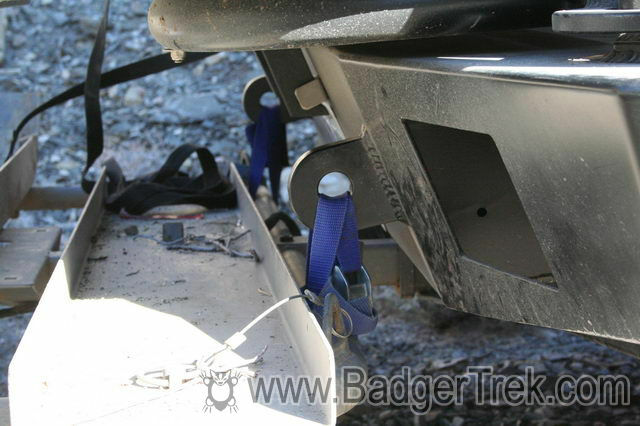 In turn we did order the Aluminess manufactured rear swing-out spare tire carrier. We were happy with the construction of the spare carrier, having no significant problems with it. Then after a year and a half, and seeing a number of the various configurations available in person at the Sportsmobile 4x4 Rally, we decided to take the plunge. We picked up the bumpers in person as it gave us an excuse to see Southern California, and make sure we were getting what we wanted without dealing with shipping. Dave and Grayson at Aluminess were kind enough to install the bumpers themselves, with us observing and assisting. They sold on our old spare carrier so we would not have to cart it around indefinitely. The only lack was the third hinge on the spare-tire side, which was not a big deal, but I do like to have redundancy since now a loss of one hinge point will probably break the other off on that side. 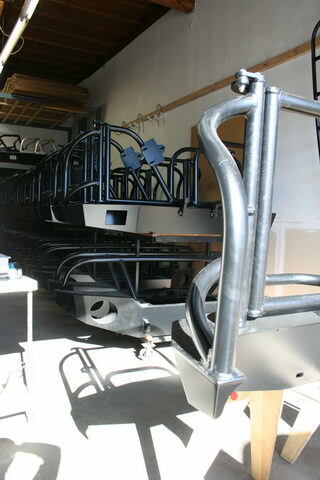 The overall storage increase the bumpers has provided has greatly improved our existence. 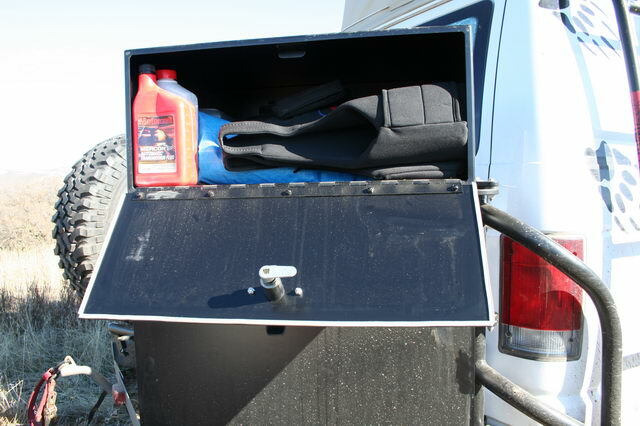 All the motorcycle, and bicycle gear, as well as emergency oil, paint, WD-40, etc has fit in the rear bumper box. The front bumper holds our chains and recovery gear, and the rear bumper body itself holds a few odds-and-ends we don't need often. This has freed up room inside for a few jerry cans of water (inside so they don't freeze, and are easily accessible), and some extra food, as well as reducing overall clutter. With the new rear bumper holding the bicycles, however, access to the roof was hampered, so we picked up an Aluminess roof access ladder at the same time. The front bumper came completely stock. The bumper is aluminum, and surprisingly light, weighing not much more than the chromed steel bumper that was up there in the first-place. The center of the bumper has a lidded box that can fit a winch, and there is a covered hole for the cable and fair-lead mounting. Since we do not currently have a winch it serves as a great spot for storing things that need not be inside, such as tire chains, hydraulic jack, and most of our recovery equipment. There are also holes in the sides of the bumper for off-road lights, which we have currently not put to any use since we are rarely driving on trails after dark. We usually like to be settled down by sun-set to avoid unpleasant surprises. Right in front are 2 large aluminum brackets for holding 7/8" Screw D-Shackles for recovery work. 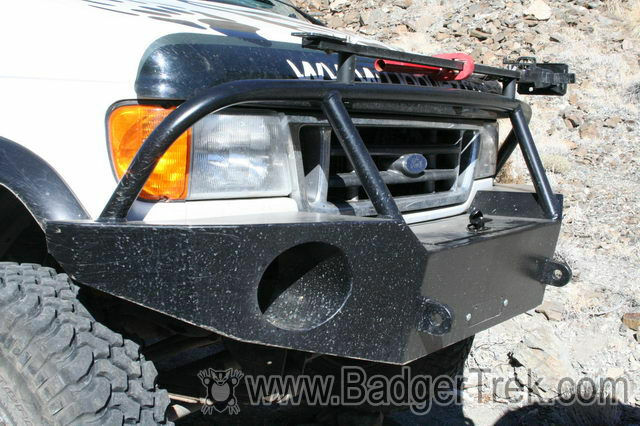 The bumper was mounted to the frame with 6 Grade 5 bolts, three per side. Built a hi-lift jack mount onto the top tube of the bumper's brush-guard. This serves to keep the jack out of the dirt and dust that it was collecting when originally mounted at the back of our van. 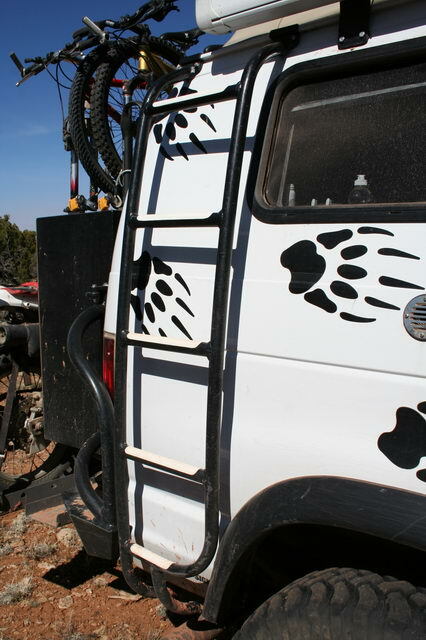 It also provides a nice visual to where exactly the front of the van is since it is only a couple inches from the front-most point of the bumper, and can be seen from the cabin. Put weather-stripping around the lid on the front bumper box. This certainly does not seal the box, but it does keep the majority of the rain-water and dust out. The change after putting the seal on was quite noticeable. The rear bumper had the most changes from the standard bumper. We had spec'd the bumper for our current needs, as well as potential future use. The bumper holds a spare tire on a swing-out on the driver's side, and a storage box on a mirroring swing-out at the passenger's side. The bumper body itself has a storage container a bit smaller than the one in the front, similarly closed with a locking lid. 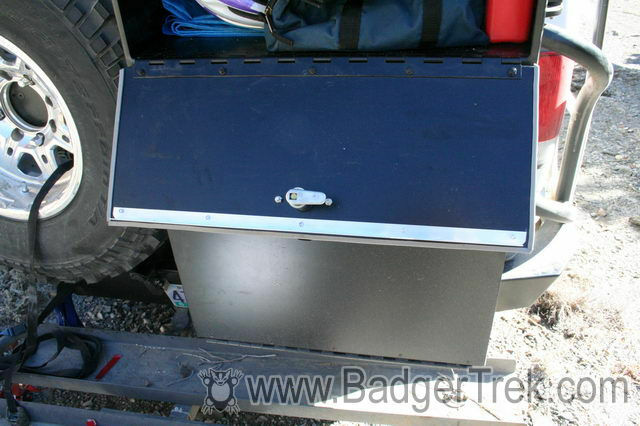 The storage box on the swing-out can hold a number of jerry-cans in the lower compartment. 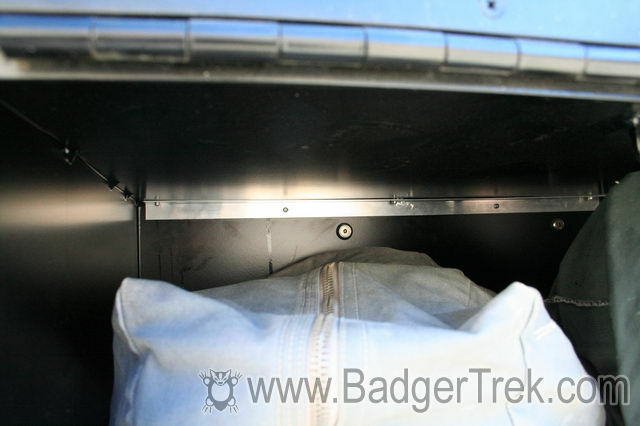 Currently it holds our motorcycle riding gear as it is inaccessible unless the motorcycle is off. 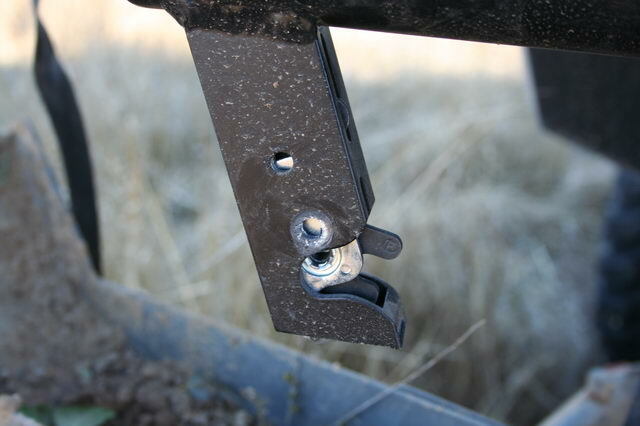 The two swingouts can lock together to spread the load across both, and to prevent someone from swinging them open and accessing the rear door. We usually keep a bolt through this point. There are cut-outs for auxiliary reverse lights which we have not put to any use. The bolts holding the towers to the rear door hinges (support) would back out on each drive. All the bolts holding the latches in, and the support straps on, were thoroughly cleaned and re-inserted with lock-tite. No problems since. The rear D shackle mounts were put in place for potential recovery scenarios, but the immediate use was to provide two distributed points of support for the motorcycle carrier. 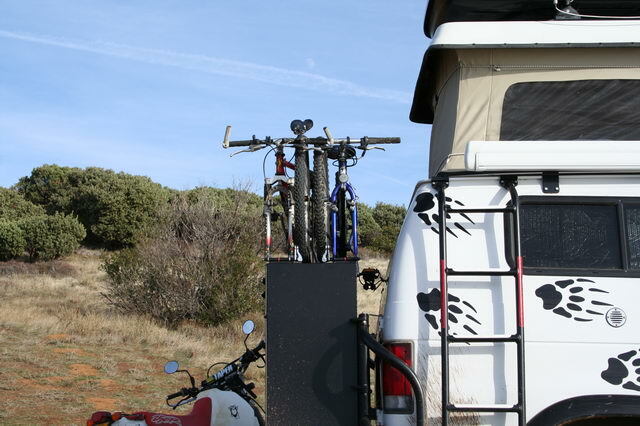 Since the motorcycle rack is held in place just by the 2" receiver, there is not a lot of strength to prevent the whole rack and bike from rocking side-to-side. Two strong cinch-straps through the shackle-mounts and around the frame of the motorcycle rack cured this rocking immediately. The doors of the compartments were flat sheets of aluminum attached at a piano hinge along the bottom, and a single point latch at the top center. This meant that the top corners could flex open when contents shifted and pushed against the doors. A strip of angle was riveted horizontally across both doors to stiffen them up. The upper door strip was also located to provide vertical support to the roof of the box where the bicycles were now bearing down with their weight. A larger gauge angle was used as a backing to the bicycle fork mounts to provide rigidity to the top of the box, and spread the load of the bicycles out. The difference before and after was quite noticeable. The doors on the rear bumper box and the rear bumper compartment were all sealed with weather-stripping to keep out the dust and moisture. Again, like in the front, it certainly doesn't hermetically seal the compartment, but keeps out the majority of the environment, and prevents the doors and frame from rubbing the powder-coat off of each other. 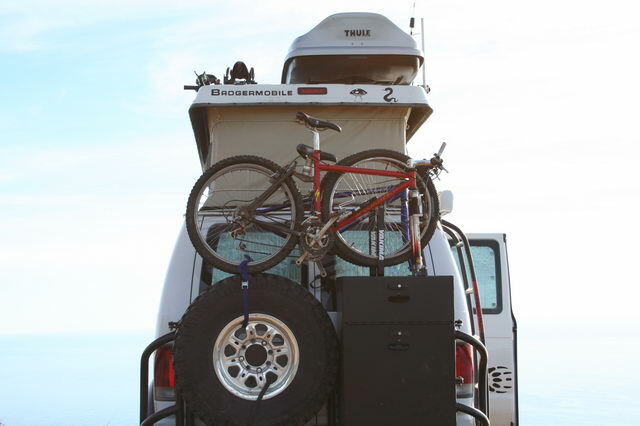 The ladder was needed due to our plans to mount the bicycles on the rear bumper, precluding the usage of the spare tire as a convenient way to access the roof and our storage up there. Other than adding some non-slip tread tape we haven't had any reason to do any changes to the ladder.